Located in Lalla Takarkoust, this family-friendly hotel is 5.4 mi (8.7 km) from Aguergour Paragliding, and within 12 mi (20 km) of Lalla Takerkoust Lake and Takerkoust Dam. Toubkal National Park is 11.4 mi (18.3 km) away. 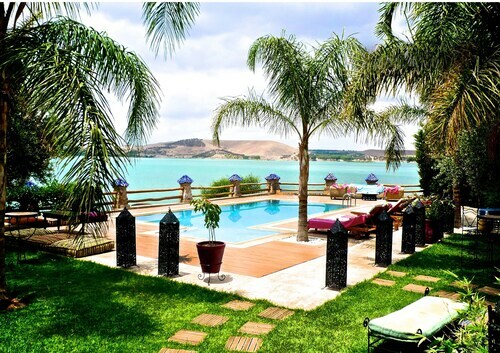 Situated in Lalla Takarkoust, this luxury riad is within 1 mi (2 km) of Lalla Takerkoust Lake and Takerkoust Dam. Aguergour Paragliding is 10.7 mi (17.2 km) away. Situated on a lake, this guesthouse is within a 10-minute walk of Lalla Takerkoust Lake and Takerkoust Dam. Aguergour Paragliding is 10.2 mi (16.5 km) away. Fore! Feel like a winner of the Masters knowing you can easily book a great selection of Lalla Takarkoust golf resorts! Whether you’re a rookie or a golf prodigy, you’ll be teeing off on your favorite green in no time. The golf hotels in Lalla Takarkoust allow you to enjoy all the benefits of staying close to the premier golf courses in the area. Improve your game by working on your backswing, stance, and grip at the driving range before heading to the fairway for a bout on the back nine. Impress a business prospect on the executive course or enjoy a delightful day on the fairway with your family and friends, then head back to one of the best golf resorts in Lalla Takarkoust for cocktails or dinner. Relax in your home away from home, knowing you’re bound to hit a hole-in-one with your hotel—though you still may need to work on your short game. From 5-star amenities to budget lodging, Travelocity offers a variety of golf resorts in Lalla Takarkoust to suit your every need. We can’t guarantee you’ll hit a double eagle on the course, but we will guarantee our prices. Book with Travelocity and your hotel will be on par, so you won’t bogey on your next golf adventure. Big and spacious room but needs updating. This was a non-smoking room/hotel but inside the room has a heavy smell. Breakfast was very good but a coffee maker inside the room would have been nice. Great Location! Great Staff! Best Tagine in town at Sky Bar! Walking distance from everything. Very good value and close to the Medina, Airport, Golf-course etc. Of course perfect with a rental car as we did. This grand hotel is surrounded by gardens worthy of being called a botanical park. The pool is lovely. The staff is attentive and friendly. The breakfast is incredible-- home made Moroccan pancakes and omelettes, as well as a spread of meats, cheeses, fresh fruits and the best pastries ever. 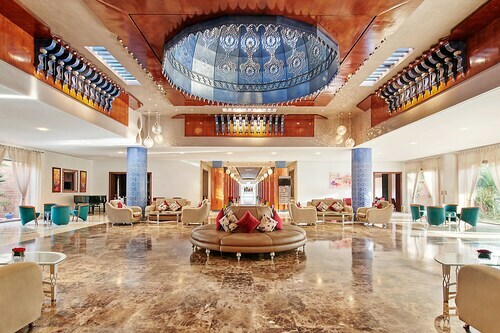 We were treated like royalty-- and felt like royalty staying at this beautiful hotel. 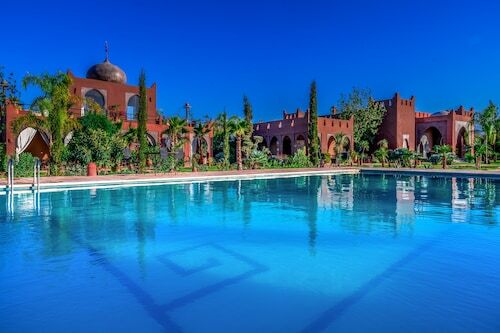 Travelocity advertises this hotel as "Grand Mogador .....". The name is actually "Ryad Mogador ....". Because no street number was given, I spent lots of time looking for it. When I finally went in, the clerk could not find my reservation and told me I was in the wrong place. I insisted he look further. Eventually, he was able to find them. 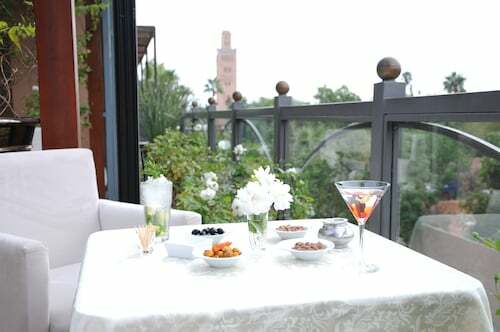 We had a fantastic stay at La Maison Arabe in Marrakech. Everything was perfect- the hotel room was spacious with a bed area, a seating area, and a lovely balcony overlooking a beautiful pool and garden. The hotel interior was luxurious with the aesthetic of an authentic Moroccan home so you feel transported to another time and place. The staff was exceeding helpful with arranging all our transportation and guide needs as well as making terrific suggestions on what to see and do. The hotel manager exceeded our expectations by researching something that I wanted to do and providing that experience. The food in the restaurant was excellent and their cooking is a not to be missed experience. We had a great stay and highly recommend this hotel.